The instrument used to communicate between Saragarhi and Fort Gulistan. An imprint of the 36th Sikhs badge. “21 vs 10,000. To the last man, with the last round." In terms of the ratio on the odds faced, only a few battles come close to those faced by 21 Sikh soldiers of the 36th Sikhs in Saragarhi, North Western Frontier Province (NWFP) in present day Pakistan. On September 12, 1897 these 21 Sikh soldiers were up against approximately 10,000 - 14,000 Afridi and Orakzai tribes of the Pashtun. The staggering ratio of 1:500 stacked against the Sikhs is both unmatched and unprecedented, ensuring their "last stand" will never be forgotten in history. The burnt out remains of Saragarhi. Fort Lockhart is on the skyline, left centre. Fort Gulistan, photographed after its relief. Note the terraced hillside that provided excellent cover to the attackers. The British manned a series of posts along the Hindu Kush ranges. These posts were originally constructed by the great Sikh Emperor Maharaja Ranjit Singh during his Western campaign. After the decline of the Sikh empire these posts were taken over by the British for the same purpose. Saragarhi was a communication relay post between Fort Lockhart and Fort Gulistan (also known as Fort Cavagnari) in the Sulaiman Range of the NWFP. Since Fort Lockhart and Fort Gulistan were not in a visual line of sight due to geographical attributes a midway heliograph communication post was built at Saragarhi. Heliography is a communication technique used by reflecting sunlight with a mirror and transmitting it via coded messages. 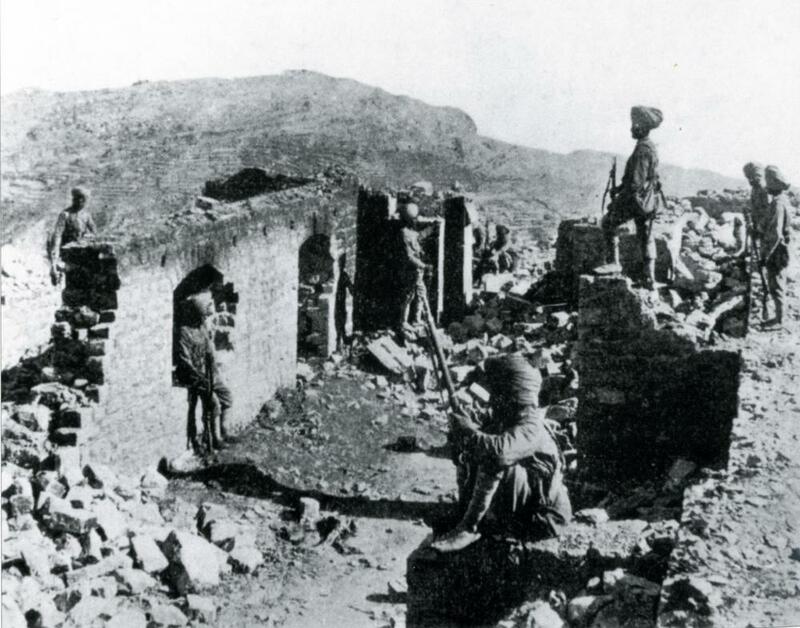 Saragarhi was vital in ensuring the survival of these two forts and the defence of the region. 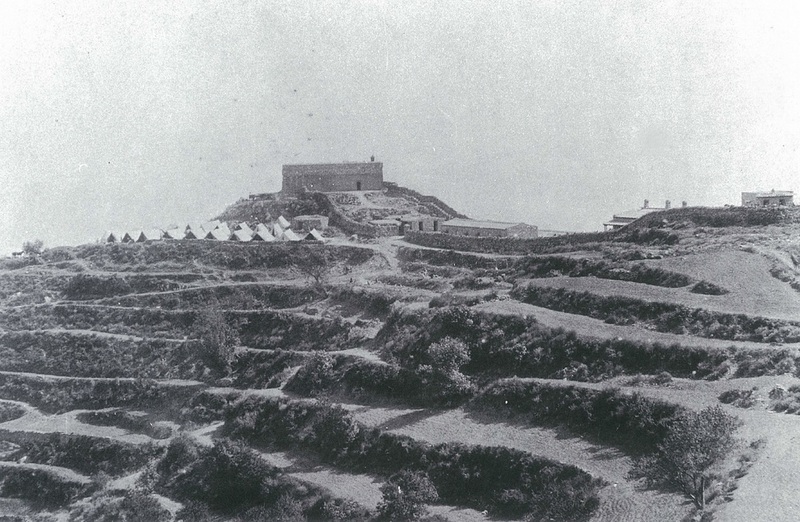 Saragarhi consisted of a small block house with loop-holed ramparts and a signaling tower. On that fateful morning when Havildar Ishar Singh (the detachment commander) peered through his binoculars from the watch tower of his post, he saw columns upon columns and rows upon rows of Pathans. Sepoy Gurmukh Singh, the detachment signaler, went up the signaling tower to set up his heliograph and began signaling to Fort Lockhart about their predicament: "ENEMY APPROACHING THE MAIN GATE...NEED REINFORCEMENT". Lt Col Haughton, Commanding Officer of the 36th Sikhs, attempted to rush his troops to assist the outnumbered Sikhs however it was too late. The Pathans had systematically cut-off the supply route between Fort Lockhart and Saragarhi. Fort Lockhart transmitted back: "UNABLE TO BREAKTHROUGH...HOLD POSITION". As he watched from Fort Lockhart, Haughton counted at least 14 enemy standards (each representing 1,000 tribesmen) facing the 21 Sikh soldiers. Sepoy Gurmukh Singh passed on this message to Havildar Ishar Singh. As he assessed the grim situation facing him and his men, Havildar Ishar Singh called upon his men to seek their consultation on whether to hold the fort or abandon their post in the hope of surviving. The Sikhs unanimously agreed to hold the position. Saragarhi flashed back: "UNDERSTOOD". A devout Sikh and fatherly figure to his unit, the troops under Havildar Ishar Singh’s command knew full well the ability of this NWFP veteran. Havildar Ishar Singh understood this terrain very well, especially the character and fighting ability of the Pathans. As the Pathans moved to begin their attack, one of the Sepoys sounded the bugle as per Havildar Ishar Singh's command and the Sikhs formed two lines abreast, one row in a squatting firing position and the other standing. Havildar Ishar Singh held his order to fire until the enemy closed in within 250m from his post. The .303 calibre was deadly and effective at this range, coupled with the grouping shots formed by the line abreast formation. The first line of the Pathan advance was completely decimated. However, there was no time to reflect upon their success. News of the event shot around the world as demonstrated by this article (one of many) in this Australian newspaper. The Pathans planned for a massive assault on all flanks - a multi-pronged attack designed to divide the outnumbered Sikhs into much smaller groups. The tribesmen attacked in two formations, one towards the main gate and the other towards the gap at the fort. Undeterred, Havildar Ishar Singh yelled their regiment battle cry together with his troops "JO BOLEY SO NIHAAL! SAT SRI AKAAL!" Whoever utters the following phrase shall be fulfilled! True is the timeless being! The tribesmen's attack was repulsed once again by the Sikhs. At this stage some tribesmen had fallen just yards away from the Sikh position. The Sikh soldiers' ranks and ammunitions were now beginning to dwindle. Out of the full strength of 21 soldiers at the start of the battle, there now were 10. The battle had gone on from 0900 hrs to 1200 hrs with the Sikhs having fought off seven charges by the tribesmen. The ever inspiring Havildar Ishar Singh was still leading his men despite being gravely injured by bullets and sabre slashes. At 1400 hrs, Sepoy Gurmukh Singh signaled Fort Lockhart Battalion HQ: "LOW ON AMMO...NEED AMMO...URGENTLY". Lt Col Haughton attempted to send his personal orderly to try and pass the ammunition to the trapped Sikhs, but again to no avail. As the Pathans attacked again, the Sikhs with less than 10 men put up a stiff resistance and managed to repel the attack once again. The tribesmen resorted to a traditional tactic. They set fire to the bushes and scrubs around Fort Saragarhi. Clouds of smoke blanketed the fort, making it impossible for the Sikhs to see the enemy. Soldiers at Fort Lockhart could clearly see the approach of the tribesmen due to their elevated position above Saragarhi. Lt Col Haughton frantically signaled Saragarhi: "ENEMY APPROCHING…THE BREACH". Havildar Ishar Singh was severely injured by this time and ordered the remaining Sikhs to fall back into the inner wall. He then ordered two Sepoys to drag him towards the breach to buy some time for his men. Out of ammunition all three of them fixed their bayonets and charged the tribesmen. With this act Havildar Ishar Singh provided the final lesson of true leadership to his men. By the time the tribesmen breached the fort, only five Sikhs remained alive. Four in the inner building and Sepoy Gurmukh Singh at the signaling tower. The Sikhs did not give up. Instead they formed an all-round defensive position with their backs against each other and their bayonets pointing outwards. In this remarkable display of bravery four more Sikhs fought hand to hand inside the fort. At 1530 hrs Sepoy Gurmukh Singh transmitted: "MAIN GATE BREACHED...DOWN TO ONE...REQUEST PERMISSION TO DISMOUNT AND JOIN THE FIGHT". Orders came back: "PERMISSION GRANTED". Sepoy Gurmukh Singh disassembled his heliograph device, picked up his rifle and came down the signaling tower to join the fight. Soldiers at Fort Lockhart saw him disappear into the thick of battle right into the tribesmen line. His last words echoed "JO BOLEY SO NIHAAL! SAT SRI AKAAL!" Sepoy Gurmukh Singh, the youngest of the Sikhs at 19 years old was credited to have taken down 20 tribesmen single-handedly before succumbing. He was the last to fall at Saragarhi. Please click on images below to view them in greater detail. The Saragarhi Memorial Gurdwara (Sikh place of worship) in Ferozepur, Punjab is a tribute to the Sikh soldiers who sacrificed their lives at Saragarhi. The memorial Gurdwara, was built by the army in 1904 with stones from the Saragarhi post and has the names of the 21 Sikh soldiers inscribed on its walls. The Saragarhi Memorial Gurdwara (at night). Martini Henry rifles first entered service with the British Army in 1871 and quickly became its mainstay. 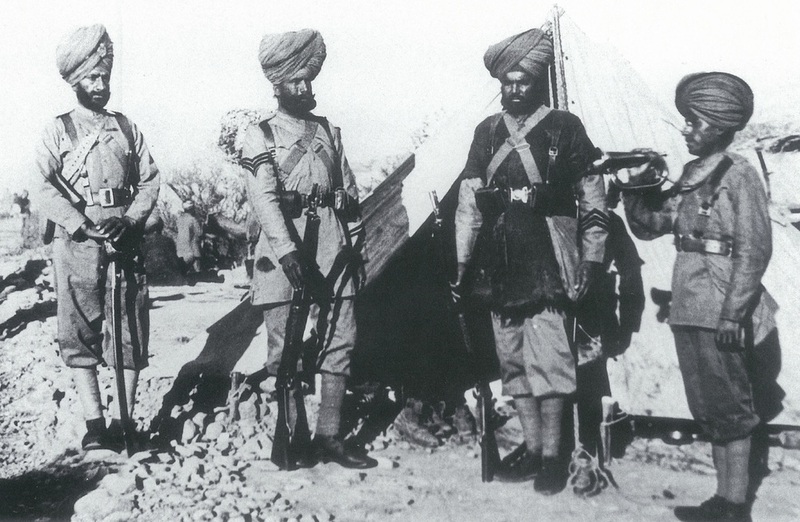 Colonial units such as the Sikhs and Gurkhas only received them after all the British units were equipped. It had only been a few months since these frontier regiments were equipped with these rifles replacing the venerable Enfield. Capable of firing ten .303 calibre rounds a minute it proved to be more than a match to the antiquated muzzle loading rifles possessed by the tribesmen. The effective range of the Henry Martini rifle was around 600 yards (550m). Without the stiff resistance of the 21 Sikh soldiers at Saragarhi both Fort Lockhart and Fort Gulistan would have easily fallen to the enemy. By defending their position long enough for the relief column to arrive with artillery support, the 21 Sikh soldiers became the crucial factor in turning the tide of battle in their favour. When the relief column arrived a day later, they saw the burnt out bodies of all the 21 Sikh soldiers, together with at least 800 dead bodies of the tribesmen strewn only yards in front of their position. Fort Cavagnari (also known as Fort Gulistan) on the North West Frontier. This artist’s impression has been taken from article that appeared in The Queenslander on 13 November 1897. The Queenslander was the weekly summary and literary edition of the 'Brisbane Courier' (now The Courier-Mail). 36th Sikhs, various ranks, 1896. On the left, holding his sword is an officer. He has a badge on his turban. Next is a Havildar with three stripes on his arm, then a Sepoy in winter dress and three good conduct stripes. On the right is a bugler. These last three other ranks do not wear a badge like the officer, but all four have a quoit circling their turbans. All four also wear boots instead of the sandals or shoes that so many of the infantrymen wore. All the 21 Sikh non-commissioned officers and soldiers who laid down their lives in the Battle of Saragarhi were posthumously awarded the IndianOrder of Merit. This was the highest gallantry award of that time which an Indian soldier could receive by the hands of the British crown, the correspondinggallantry award being the Victoria Cross..
Medal shown is of Sepoy Harnam Singh also of 36th Sikh Regiment. Medal earned at Fort Gulistan on 13 September 1897. Photo kindly provided by Avtar Singh Bahra from his private collection. Survivors of the Gulistan sortie party pose with the captured Afridi standards for a photograph by Lt. Col. Haughton. They greeted the relief force by parading these trophies at the gate. Defenders of Fort Gulistan with two soldiers of the 36th Sikhs. The above mentioned saga of valour has been compiled using various sources.